Darjeeling: The stage is all set in Kalimpong for the Chief Minister's visit. This will be her first visit to Kalimpong after having declared Kalimpong as a full fledged district on February 14, 2017. Chief Minister Mamata Banerjee will arrive in Kalimpong on May 28. She will be returning to Kolkata on June 1. "The CM will arrive on May 28. She will attend a function of the All Development Board Coordination Committee meeting on May 29 to be held on Dr Graham's Homes school ground. On May 30, she will hold an administrative meeting with the District Administration and Police," stated Dr Viswanath, District Magistrate, Kalimpong. The Chief Minister will create a new political equation in the Hills. Earlier, under Bimal Gurung relations had hit an all-time low between the Gorkha Janmukti Morcha and State Government. However, after the agitation and the 104-day bandh along with the exit of Gurung, political equations have changed in the Hills. Binay Tamang, as the President of the GJM and Chairman, Board of Administrator, GTA has announced a "Zero enmity" policy. He had earlier announced that he will work in coordination with the State Government and the Hill political parties for development, peace and economical upliftment of the Hills. Both the GJM and TMC are all set to welcome the CM to Kalimpong. Party flags have been put up along all major thoroughfares with welcome gates and cutouts of the CM. 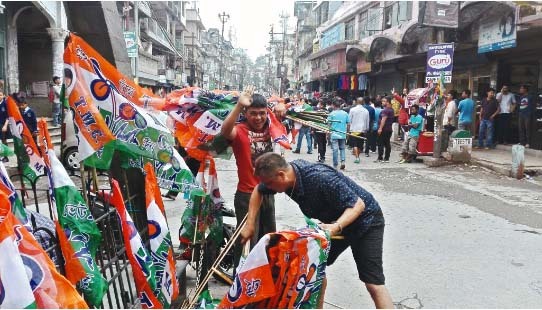 The GJM is expecting a turnout of more than a lakh party supporters to welcome the CM from Sevok to Delo Tourist Lodge in Kalimpong, where the CM will be putting up. "Preparations are on by both the GTA and GJM members to welcome the CM. We have already put up welcome banners and welcome gates all along the way. There will be a representation from the GTA to welcome her," stated Binay Tamang. Similar preparations are on by the TMC memebrs as well. The stage is all set in Kalimpong for the Chief Minister's visit. This will be her first visit to Kalimpong after having declared Kalimpong as a full fledged district on February 14, 2017.